This is a post by our friends at AND CO, an invoicing app for freelancers. Check out our co-created Freelance Contract here. As an independent, you might be officially exempt from an end-of-the-year performance review, but—NOT SO FAST!—just because you’re the boss doesn’t mean it isn’t worthwhile to step back and goal-set when it comes to the course of your freelance career. Here are a few quick tips to help make 2018 your best year ever. Whether you’re several years into your freelance career or just getting started, you can probably relate to the feeling of running on a hamster wheel, constantly juggling projects and engagements with little time for reflection and goal-setting. It’s time to make time in 2018. Being busy is a generally a good sign. It means you have a healthy pipeline of work and can take your pick of the projects and clients that best align with your strengths and passion points. Nonetheless, absent a concrete business plan and measurable goals, you risk floating aimlessly through your career. Absent a manager and full-time employer, your career growth might stagnate—even though your bank account might be healthier than ever. If 2017 was fraught with instances of you needing to nag clients to pay you, you’re far from alone. In fact, per the Freelancers Union, 70 percent of freelancers have been stiffed. Many more (read: almost all of us) have had to deal with the inconvenience of a late payment. While irregular payment cycles are a function of the freelance life, there are simple steps you can take in 2018 to cut down on the amount of hours you spend chasing clients to get you paid. Never begin work without a signed contract and SOW in-hand. Don’t know where to start? Use this free template. If you can, negotiate more rapid payment terms. While the standard is net-30, that doesn’t mean you can’t ask for payment up front or within two weeks of an end date. Avoid typos and other careless errors on your invoice, which can hold up payment. Include your preferred payment method and banking details on every invoice. Use a tool like AND CO to establish recurring invoice and payment schedules. Set up the cadence of invoicing and payment once and never forget to bill your client again. If you want even more speed, integrate your payments with Stripe or PayPal. Keep in mind, however, that these services charge a small fee: about 3 percent for each service if your yearly revenue is under $1MM. Make it stupid-easy for clients to pay you electronically via bank transfer or credit card. AND CO invoices, for example, include a “Pay Now” button for instant payments. As you mature in your freelance career, tracking financials is less about making sure you have enough to pay rent, and more about how you are planning key business (and personal) decisions around your income level at a moment in time. When you were in a full-time role, keeping tabs on your ins and outs was much simpler since you were likely paid out similar amounts on a regular, recurring schedule. Per a recent study, most freelancers juggle multiple clients and projects at a time—and each of these will have their own start dates and invoicing schedules. Suddenly, tracking your money is tedious at best and an absolute nightmare at worst. 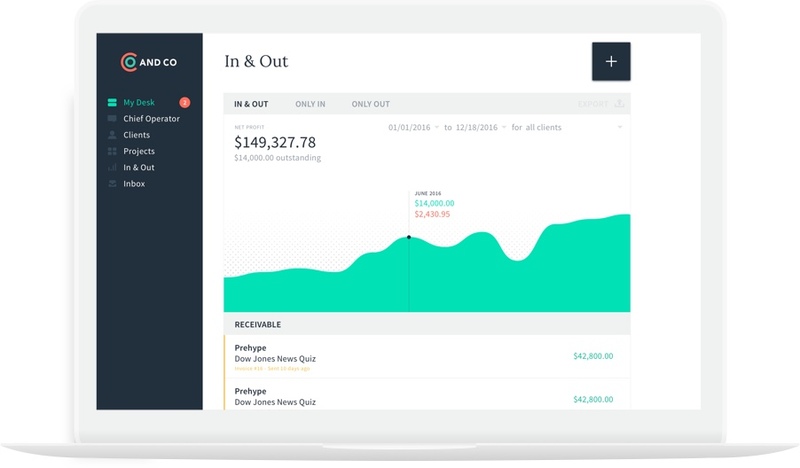 When static spreadsheets no longer cut, consider using an smart accounting software that automatically tracks for your invoices and bank activity. AND CO’s business reporting tool allows you to see a snapshot of your financial health at a moment in time. Chances are, a good portion of your new business is coming from word-of-mouth referrals or past contacts. But are also you thinking about how to grow your pipeline beyond there? Going outside of your network can be especially valuable if you’re “hunting” for specific types of client profiles that best align with your defined business strategy (e.g. product design for fintech platforms, or editorial positions with direct-to-consumer startups). Want more growth hacking tips for freelancers? Download AND CO’s new book, “Hacking Indepenence” (it’s free with a social share!). An important piece of advice I received early in my freelance career was to templatize my services rather than reinvent the wheel each time I began a new project. Operationalizing yourself in this regard will take some time commitment at the onset, but you’ll ultimately save hours down the road. I started this process by thinking through some of the assets I found myself creating (and recreating) across most of my engagements. I wrote them down in a list and used this as a source to begin building a workable template for each—something that could be reused for each new project. Short-form “about me” copy for use on my portfolio website, LinkedIn, social presences, and email communications. Short-form case studies. I suggest drafting a bulleted list of a few projects that exemplify your breadth of services. Keep these descriptions short and data-driven. Cold outreach email template: For reaching out to prospective new clients to begin an initial conversation. One-page proposal and SOW summary. This would precede a more formal SOW and is designed to create alignment on the brief prior to creating more formal paperwork. Contract template. I use this customizable template wizard created by AND CO and the Freelancers Union. Thought-starters template. I use this generic pitch deck when it’s important to provide a few thought-starters ahead of kicking off a project. Recap deck to provide a summary of wins and takeaways at the end of the month (for retainers) or project (for standalone work). Best practices library. The key to building a pipeline of recurring work is to evolve from being seen as a fractional employee to a true strategic partner. Most often, this comes in the form of education around your specific area of expertise. For example, as someone who provides PR services, I’ve created some basic manuals on interview and speaking best practices, which I share as needed. Invoices. Seems simple, but using a templated invoice will help you save time and stay organized. 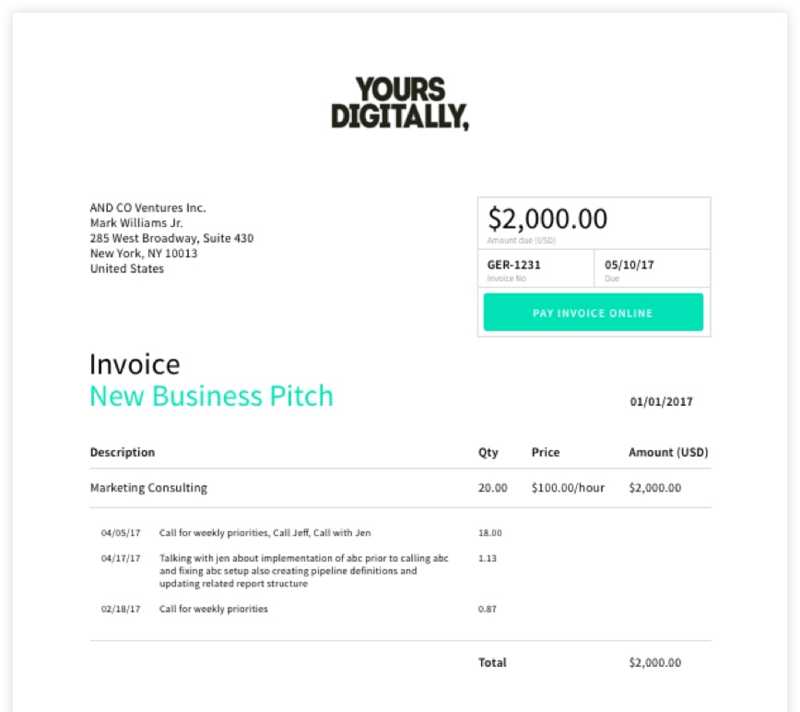 If you have the AND CO app, you can create branded invoices in about 20 seconds. The app will even tell you when your client has viewed it. Need other random slides? Check out some free templates here. Templated invoices save time and ensure that you’re always looking polished in the eyes of your clients. A common mistake among freelancers is to downplay the amount of time you’ll spend on non-billable projects such as contracts, accounting, marketing, and other necessary paperwork that can add up to hours of additional work in a given week. You might be scoped at 40 hours per week, but with these extra tasks you might find yourself pulling late nights and struggling to meet your deadlines. In fact, the non-billable stuff might be contributing to the bulk of your freelance stress. Cross-platform project managers like Asana, ToDoIst, and Evernote are helpful for keeping ideas and notes in sync across the multiple projects you juggle. Using a freelance accounting software will help you keep track of when to invoice clients, when to follow up on payments, and what to expense when it comes time to handling your taxes. Automate your banking so you don’t need to think about saving for retirement (or a rainy day). * If you go this route, create a buffer in your account that will protect you from overdrafts should your client be late to payment. Instead of wasting time proofing emails and deliverables for grammar inaccuracies or sloppy mistakes, use a tool like Grammarly. It’s like having a free copy editor at your disposal at all times. In addition to delivering excellent work, building a strong personal brand is one of the few ways to stand out among the increasingly crowded freelance marketplace (there are 55 million of us, after all!). Absent first-hand experience with a prospective client, you’ll be leaning on your personal brand to get your foot in the door and kick off initial conversations. Set up a custom professional domain and email address. Create a simple portfolio site, built on platforms such as Squarespace or About.me. Key things to Include are your bio, capabilities, sample client work (logos are great for social proof), and a contact page. Clean up your social channels. On Facebook, view your profile in a logged out state to see how your content appears to someone outside of your network. On Twitter, consider cleaning up old tweets with a tool like Tweet Delete. On LinkedIn, revisit your headline and description copy. Go Google yourself. Clean up any old accounts that might pop up in a search. Create a list of go-to references. List out your top professional references. Notify these people in advance and recap your business goals so they can share the most relevant information or anecdotes with your prospects. Bonus: If they’d be willing, LinkedIn endorsements can be incredibly powerful, as well. Timesheets are a common gripe among people who’ve worked in an agency setting. Though they are certainly tedious, timesheets are important for tracking client profitability and avoiding scope creep (AKA that sneaking feeling that your client is getting double the work they are paying for). Timesheets may not be fun, but they allow companies to improve resourcing and profitability. COOs love them for this reason. In a freelance setting, tracking your time is equally important. It’s the only way to know exactly how much time certain tasks are taking you, and which projects are dramatically exceeding scope. Over time, time-tracking data can help you create more accurate scope estimates and double-down on the types of clients and projects that are most profitable. Time-tracking can be as easy as hitting a button on your phone or browser and it will pay off in the long run—especially if your time-tracking app syncs with your invoicing solution. Freelancing comes with its own unique set of tax rules and it’s on you to educate yourself about them. At the bare minimum, you should understand how to file your quarterly estimates and understand the types of tax write-offs you’re eligible for as a freelance professional. “The Ultimate Tax Guide for Freelancers” by your pals at Freelancers Union. Self-employment tax calculator: Freelancers are obligated to pay a self-employment tax, which should be estimated on a quarterly basis. As your business grows you might find it worthwhile to hire an accountant. Start by asking your friends in the freelance community for references, since a word-of-mouth endorsement will be more helpful than a Google or Yelp search. Finally, the proposed tax plan under the current administration could mean significant changes for freelancers based on your income and filing status. Follow the legislation closely over the next few months to prepare yourself for the coming updates. Being a freelancer doesn’t mean going it alone. There are a host of freelance organizations (Freelancers Union included!) that provide ongoing opportunities to interact with other people in the community. Forbes also hosts regular roundtables for women in freelance. For more information, contract Katheryn Thayer at KThayer@forbes.com. Working Not Working events, which are tailored to freelance creatives in particular. Local or virtual General Assembly or Skillshare classes. Twitter chats, message boards, and other digital gatherings. What resolutions do you have for the coming year? Send us a tweet @freelancersu!